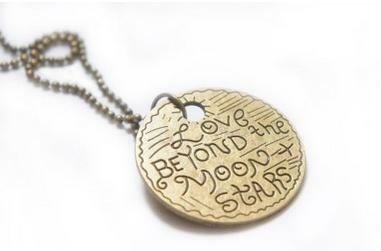 Love Beyond the Moon and the Stars Pendant Necklace Only $2.22 + FREE Shipping! You are here: Home / Great Deals / Amazon Deals / Love Beyond the Moon and the Stars Pendant Necklace Only $2.22 + FREE Shipping! I love this saying! Right now, you can snag this cute Love Beyond the Moon & Stars Pendant Necklace for only $2.22 + FREE shipping! !